MINNEAPOLIS, Minn. — Polluter-backed Congressional resolutions to block the Clean Power Plan passed the Senate Tuesday night in spite of widespread public support for the policy’s life-saving steps to curb unlimited carbon pollution from power plants for the first time ever. These legislative efforts to block the policy are expected to be vetoed by President Obama. The resolutions are an extreme and controversial legislative tool that fall under the Congressional Review Act (CRA), which allows Congress to nullify a final administrative rulemaking. According to the Government Accountability Office, lawmakers have only struck down one rule using CRA resolutions in 43 attempts and this tactic has been called extreme by both sides of the aisle. Minnesota Senators Amy Klobuchar and Al Franken voted against the resolutions. “We applaud Senator Franken’s and Senator Klobuchar’s decision to side with the health and safety of their constituents and reject these polluter ploys to block the Clean Power Plan in Washington. “These legislative gimmicks are just distractions from the great benefits the Clean Power Plan will bring to our state. The policy will protect our air and water from fossil fuel pollution while promoting our transition to a clean energy economy, which will bring good jobs and more opportunities from 21st century energy technologies like solar and wind. “The Sierra Club will be carefully reviewing the final Environmental Impact Statement that was released today. But we already know that the risks of PolyMet’s flawed plan, and of sulfide ore mining, far outweigh the potential benefits. 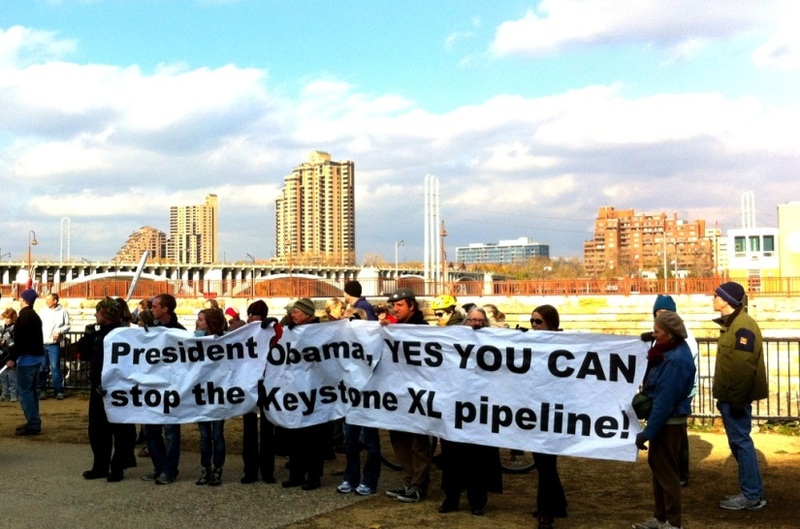 [Minneapolis, MN] – Today, the Sierra Club and local North Star Chapter celebrated the Obama Administration’s decision to reject the proposed Keystone XL pipeline, further cementing his climate legacy. “President Obama said yes to clean energy and public health, and no to dirty oil and dangerous pollution. The Sierra Club is thankful that President Obama has chosen the clean energy promise of prosperity and innovation over the dirty fuels of the 19th century,” said Sierra Club Executive Director Michael Brune. “Stopping the Keystone XL pipeline is a victory for the planet, for the health and well-being of the communities along the pipeline route, and for future generations to come. It also demonstrates the power of the millions of people who raised their voices in opposition to the pipeline, and of the growing movement to end our dependence on dirty fossil fuels. Now, instead of building a pipeline that cuts our country in two, we are free to invest in clean energy that creates jobs and brings our country together,” said Brune. While rejection of the Keystone XL pipeline is a major step forward, Minnesotans also have their land, water and the climate put in jeopardy by the expansion of tar sands pipelines here at home. Another Canadian company, Enbridge, is pushing a proposed expansion of the Alberta Clipper that could be just as large as the Keystone XL pipeline. “We applaud the President’s leadership to reject Keystone XL, as urged by thousands of Minnesotans and Sierra Club members who raised their voices through endless phone calls, emails and as part of the 5,000-person march in St. Paul this June,” said Terry Houle, Beyond Oil and Tar Sands Committee leader of the Sierra Club North Star Chapter. “Unfortunately, pipeline proposals continue to advance that would wreak havoc on our environment while contributing no lasting benefit for our economy. The proposed Alberta Clipper pipeline expansion, which would move 800,000 barrels per day of tar sands oil through our state, threatens Minnesota’s waters and communities and poses just as much risk as the Keystone XL pipeline,” said Margaret Levin, State Director of the Sierra Club North Star Chapter. “We applaud the President for his courageous decision today. This is a clear signal that the oil industry’s destructive, dangerous new proposals won’t withstand public scrutiny. We urge the President to continue his leadership and commitment by requiring a full environmental review of the Alberta Clipper,” said Levin.